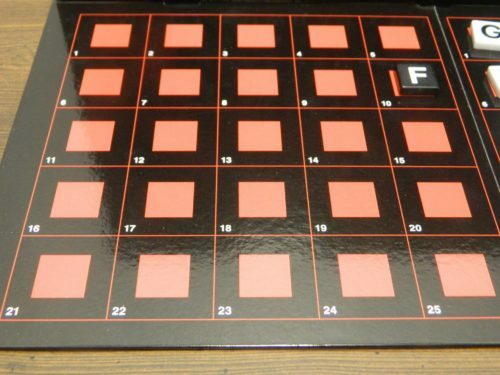 Originally created back in 1972, Decipher is a board game that mostly went forgotten for quite a long time before it was re-released back in 2016. Before seeing it in a thrift store recently, I had never heard of the game as it came out quite a few years before I was born and didn’t seem to really catch on. Looking at the game’s concept I was intrigued as the game looked like an interesting combination of a deduction game mixed with a word game. 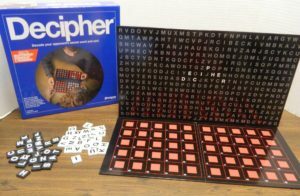 Regular readers of Geeky Hobbies know that we have looked at quite a few different word games in the past and yet I can confidently say that I have never played a word game quite like Decipher before. In a lot of ways Decipher is a game that was before its time. Decipher is not a perfect game, but it creates a compelling game by successfully combining a word game with a deduction elements. Insert the three plastic stands into the holes in the gameboard. Lay the gameboard out on the table. Slide the barrier into the stands. Each player chooses a set of tiles and randomly selects one of their tiles. Whoever picks the letter closest to the beginning of the alphabet will start the game. The word must be in English. You cannot use proper names, contractions, or hyphenated words. The player sorts the rest of their cards alphabetically. The tiles are placed on spaces 6-25 on the right side of the gameboard. This player has chosen to use the word “games” for their secret word. They spell out the word over the first five spaces. They then place the remaining tiles in alphabetical order on spaces 6-25. A player can begin their turn by making one guess at the other player’s secret word. There is no punishment for an incorrect guess. The player will then choose a number between 6-25. The other player gives them the tile that they have on the chosen number. The player will place this tile on the corresponding number on the left side of their board. This letter tile can give the player a couple different pieces of information. First the letter on the tile cannot be part of the secret word. This player asked for tile ten from the other player. They received the F tile so they know F cannot be in the other player’s secret word. 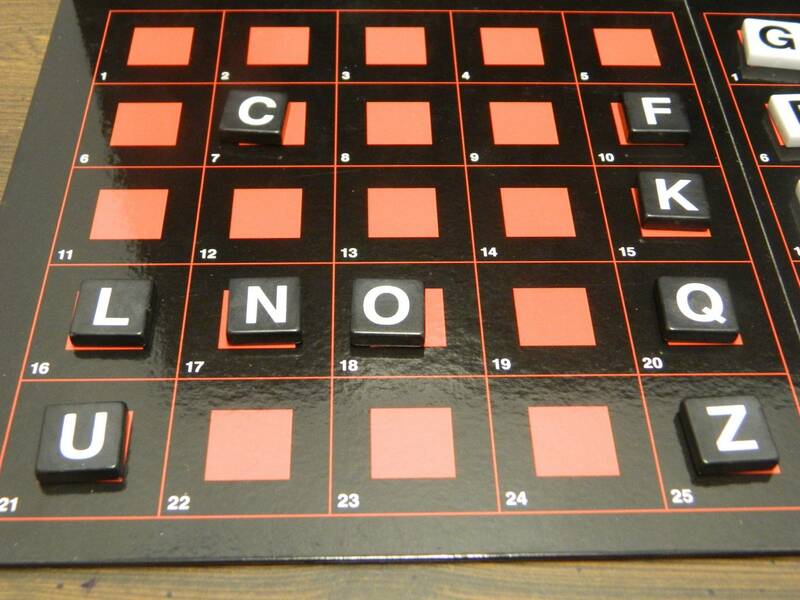 Other information can be gathered based on which letter tiles are missing. Since the other player had to place their letter tiles in alphabetical order, when you are given a tile you might notice that one or more tiles are missing. For example if you ask for tile 10 (the five tile) and the other player gives you a F tile, you know that one letter between A-E must be in the secret word. You can figure this out because F is the sixth letter of the alphabet and it is the fifth letter remaining for the other player. As players get clues about which letters are missing, they can take notes on a sheet of paper. For this round the player asked for tile seven. 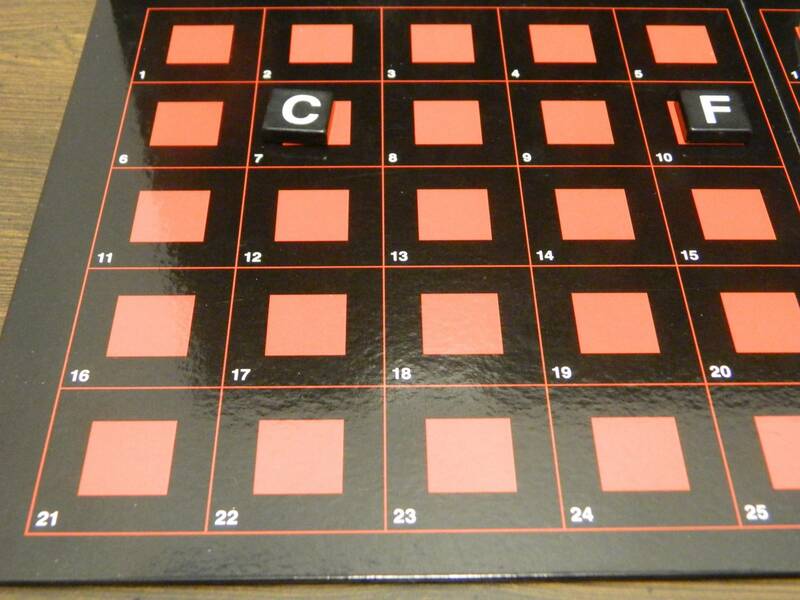 They received a C. As there is only one tile and two letters before C, it means that the other player’s secret word must either have an A or B in it. After a player has received their letter tile, play passes to the other player. If a player correctly guesses the other player’s secret word, they automatically win the game. This player has figured out four of the five letters that make up the other player’s secret word. The word has to have a M as there are no tiles between L and N. The secret word also has to have R, S, and T as there are no letters between Q and U. The final letter has to be an A or B as there is only one tile before C. Putting these letters together the player figures out the other player’s secret word is Smart. As this player has figured out the other player’s word, they have won the game. If both players have figured out all of the letters of the other player’s secret word, both players have three guesses in order to guess the other player’s secret word. If neither player can guess the other player’s secret word after three guesses, the game ends in a draw. 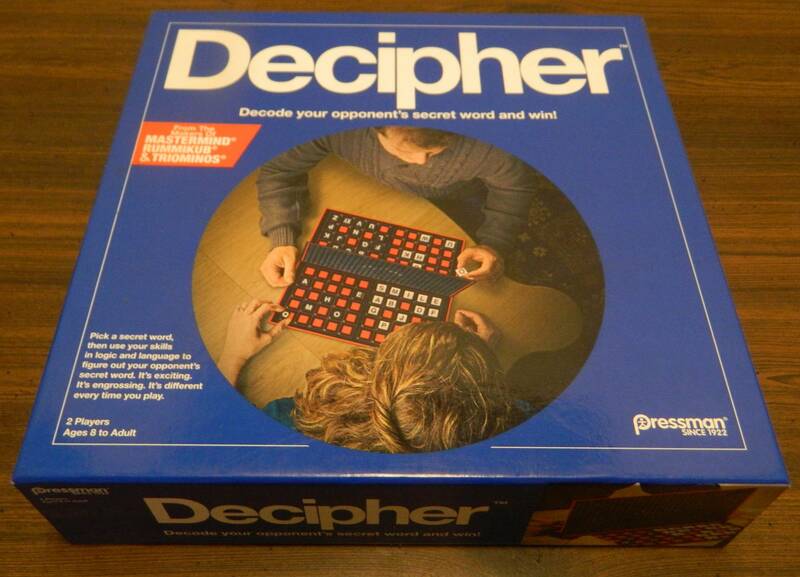 When I first saw the box for Decipher I will admit one of the things that stood out the most was the claim that Decipher was made by the makers of Mastermind, Rummikub, and Triominos. I was intrigued because on the surface that looks pretty impressive as all three games are pretty popular and loved by a lot of people. With a little research though this statement ends up being pretty misleading as none of the games share the same designer. Instead all three games along with Decipher are made by Pressman Toy Corporation, which makes the statement true but misleading at the same time. Decipher may not have been created by the same designer as Mastermind, but it actually shares a decent amount in common with it. Just like Mastermind, each player has to come up with a secret code word. The players take turns gathering information in order to break down what letters make up the other player’s secret word. This is done by asking for a tile that is on a specific space on the other player’s side of the board. At first it might seem like you have only been given one letter that can’t appear in the secret word. Each of these tiles can give you a lot more information though. You can use the tile that you are given to determine if there are any missing tiles before or after the tile you were given. Through deduction the players will eventually figure out the five missing letters. Players then have to rearrange these five letters in order to come up with the secret word that the other player chose. The first player to do this wins the game. Decipher has its’ own problems, which I will get to shortly, but I was actually surprised by the deduction mechanics in the game. They are actually surprisingly clever and actually work better than I was expecting. Before I read the rules for Decipher, I thought the game would play like Mastermind with letters or maybe even like Wheel of Fortune. Instead the deduction mechanic in Decipher mostly focuses on figuring out what sections of the alphabet are missing a letter(s). The players then try to narrow down from there to figure out which specific letters are missing. While each player’s strategy is going to slightly differ, the main strategy in Decipher is to break down the letters into different sections. Breaking up the letters into different sections allows you to narrow down the possibilities quicker. For example you might want to start the game picking a number like ten or eleven. After asking for space ten, you are given the letter E. As E is the fifth letter in the alphabet and would normally be placed on space ten (spaces 1-5 are filled with the secret word), it means that A-D must fill spaces 6-9. Therefore you don’t need to waste your time asking for numbers 6-9. If you would receive a F/G/H/I for space ten though, it would mean that 1/2/3/4 letters of the secret word are missing between A and the letter you received. In a later round you could then pick a number between six and ten to narrow down the potential missing letters even more. This is basically how the first part of Decipher will go. You will find sections where there are letters missing and will then try to narrow down what letter is missing by asking for numbers in that section. This might seem a little simple strategically, but I actually thought it was pretty fun. It is compelling trying to narrow down which letters could be missing. The strategy might not be deep, but it can actually have a pretty big impact in the ultimate outcome of the game. A player that is good at narrowing down the missing letters could gain a couple turn head start on figuring out the other player’s word. I think this mechanic is the perfect combination of being accessible and compelling for both adults and children. Eventually both players will likely approach the game in this way. This presents some interesting ideas of how players should approach coming up with their secret word. As will become clear later, whenever possible you want to try and come up with a word that has several anagrams (words that can be formed with the same letters as your code word). This can potentially gain you a couple extra turns as the player might end up guessing one of these anagrams before the word you chose. A couple extra turns could be the difference between winning and losing the game. The more interesting decision is whether you should pick a word where most of the letters are near one another or one where all of the letters are far from each other. Both strategies have positives and negatives. Choosing a word with most of the letters near one another in the alphabet can either be really good or really bad. This strategy could lead to the other player wasting several turns getting tiles that don’t help them. The problem is that if they narrow down the section where all of the missing letters come from, they can find all of the missing letters pretty quickly. This is why I think spreading out your letters would be the better strategy most of the time. Every tile the other player receives will probably give them some information. They will have to search the entire board though which likely will take them quite a few turns. For the most part I really liked the deduction mechanics in Decipher. The only real problem that I had with them is that once you have come up with a strategy that works for you, there really is no reason to stray from it. This leads to a problem where you likely will just use the same strategy every game. The mechanic is fun but I can see it getting kind of repetitive after a while. The only real changes that you will have to make to your strategy will depend on where the missing letters are on the other player’s board. While this aspect of the game is still fun, it is the main reason why I would say that Decipher is the type of game you play a couple times and then put away for another day. Once one or both players have figured out all of the letters in the other player’s secret code, it is time to move onto the word portion of the game. Getting a few extra turns to figure out the other player’s word gives you a big advantage in this portion of the game. You will still have to figure out the word though. Players need to be able to rearrange the letters in order to figure out the other player’s word. If you really struggle with this aspect of the game, you are going to have a hard time winning the game. It doesn’t matter how quickly you come up with the letters if you can’t rearrange them into the right word. This is where it is beneficial to come up a word that has several anagrams. 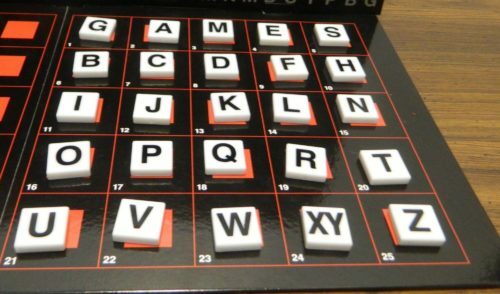 Players could end up spending several turns trying all of the different combinations until they ultimately come up with your word. Other than players likely repeating the same strategy in every game, I would say the biggest problem I had with Decipher is that the game limits the type of words you can use in the game. Outside of not allowing proper names, foreign words, contractions, or hyphenated words; Decipher has two other restrictions on what words you can choose. The first is that you can’t form any words that feature two of the same letter. This makes sense from a gameplay perspective as it would basically ruin how the game was played. Without some drastic changes to the gameplay, there is no way you could allow double letters. This doesn’t impact the game a lot, but when you are trying to come up with a word you quickly realize that there are a lot of words that feature double letters that you are unable to use in the game. The other limit in the game is how many letters you can use. 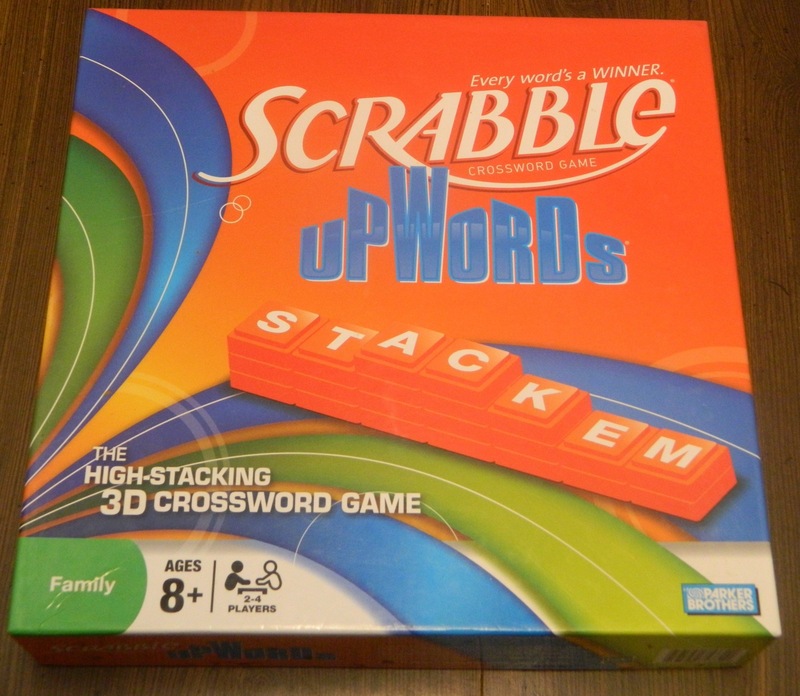 Using the standard rules for Decipher, players have to use a five letter word. There are a lot of five letter words in the English language so you shouldn’t have that much trouble coming up with a word. Putting a limit on the number of letters though does reduce some of the flexibility in the game. Unlike the double letters problem though, this issue is actually really easy to fix. Both players would have to agree to using the same number of letters, but you could either use longer or shorter words if you wanted. You would just have to adjust which space the letters not used in your secret code word would start on. As long as the players can remember this space (as it no longer will conveniently be the end of the first row) you shouldn’t have any problems. I think this would be an interesting way to tweak the difficulty of Decipher. You could use three or four letter words with younger children, while six or more letters could really challenge players who play a lot of word games. Decipher’s component quality is going to somewhat depend on which version of the game you purchase. For this review I used the 2016 version of the game. The component quality for the 1972 version of the game seems similar but I can’t verify as I only have the newer version of the game. Basically the game consists of two boards and two sets of letter tiles. The boards are of a decent thickness but they are kind of bland. The letter tiles are decent even though I would have preferred that the letters be engraved. This would have made it harder for the letters to fade off after extended use. 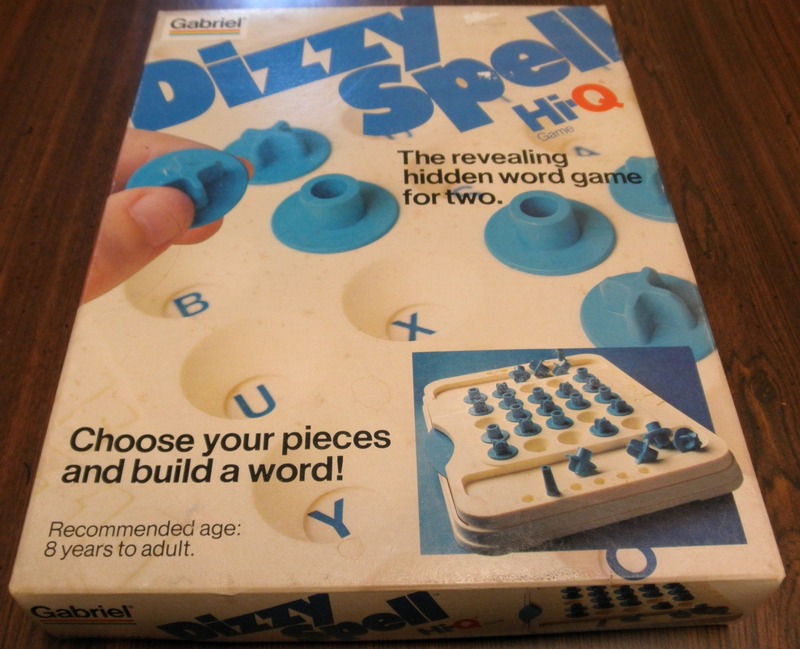 Despite being a somewhat forgotten game from the 1970s, I would say that I was kind of surprised by Decipher. Decipher somehow finds a way to combine a word game with a deduction game. I have played quite a few word games, and yet have never played anything quite like Decipher. The strategy in the game might seem a little simple but I found it to be compelling. Good strategic decisions are not necessarily going to win you the game, but they can give you a couple turn lead over the other player. While I thought the deduction element of the game was pretty fun, it can get repetitive after a while as once you come up with a good strategy you likely will repeat it in all future games. After you have figured out all of the letters in the other player’s secret word, you need to rearrange the letters to figure out the other player’s secret code word. A good strategy can get you a lead, but the game ultimately comes down to who can figure out the other player’s word first. I wish Decipher had a few less restrictions regarding words you can use, but most of these you can change pretty easily. At the end of the day Decipher is a fun, original deduction word game that is worth bringing out every so often. If you don’t really care for word or deduction games, Decipher is probably not going to appeal to you. If you like Decipher’s concept though, I think you will have fun playing the game. If you can get a good deal on Decipher, I would probably recommend picking it up. A really interesting combination of a word and deduction game. 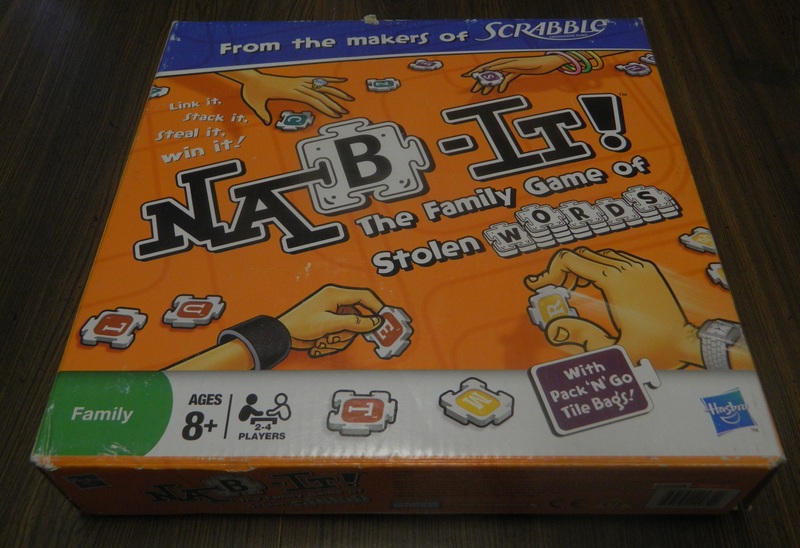 Easy to play and has a decent amount of strategy for a word game. Once you have developed a strategy, you will probably use it in every game. There are some limits on what words you can use in the game.